On March 1, the Maharashtra State Assembly, which is dominated by an alliance between the Indian National Congress and the Nationalist Congress Party, passed a bill that gave 400,000 additional families the chance to move out of the slums and into free government housing. The bill had been promised by the Indian National Congress, which leads the governing coalition in New Delhi, in the 2004 and 2009 state elections but then was shelved for a decade. The new measure made more slum dwellers eligible for an existing government housing program, which was created in 1996 to fulfill a campaign promise that the Shiv Sena-B.J.P alliance made to the four million residents in the city’s slums. Under the original program, only those who had lived in Mumbai before 1995 qualified for the program, but now any slum dweller who was in the city before 2000 can get a new home. Under the program, once the Slum Redevelopment Authority has the agreement of 70 percent of the residents of a community, it can begin to redevelop the slum. Redevelopment is carried out through a private company, which receives free government land to build apartments of 25 square meters, or 270 square feet. Half of the apartments must go to the slum dwellers, and half of them can be sold by the developer for profit. Activists and urban planning experts say the current approach to slum redevelopment amounts to political tokenism and only maximizes the profits of private developers. “The cut-off policy belongs to an overall approach to politics and slums that is arbitrary and keeps one section of people vulnerable and dependent upon favors and electoral promises,” said Amita Bhide, the chairwoman of the Center of Urban Planning, Policy and Governance at the Tata Institute of Social Sciences in Mumbai. A better alternative would be a program led by the state government that required slum residents to contribute financially to their new homes, she said. The projects that have been completed are often untenable, urban planning experts said, because they are on the periphery of the city, far from residents’ jobs and communities. 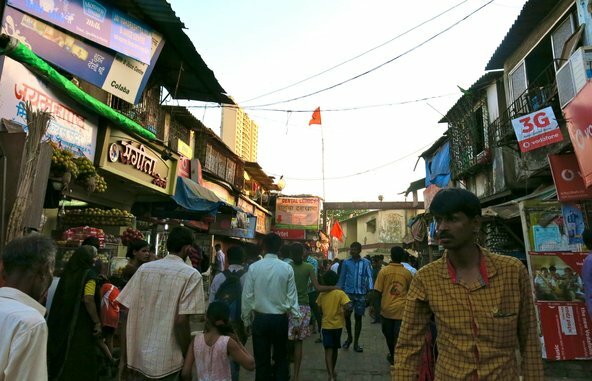 “You cannot wish away the slum dwellers from the city – you need to try to integrate them into the urban fabric at large,” said Mustansir Dalvi, professor of architecture at the Sir J.J. College of Architecture in Mumbai. The Aam Aadmi Party, which is new to Mumbai’s political scene, is gaining popularity among slum dwellers because of its focus on these neighborhoods, fielding candidates like Medha Patkar, an activist who has worked with slum dwellers and has protested the demolition of illegal slums on many occasions. In its manifesto for Mumbai released on April 11, the Aam Aadmi Party included a promise to increase the minimum size of an apartment in the slum redevelopment program from 25 square meters to 42 square meters and to include slum dwellers’ participation in the redevelopment. The party also supported granting all slums legal status, which would entitle them to free government housing, rather than only those built before 2000. Despite the lofty promises of the current and previous state governments, only 153,000 slum dwellers have received their new apartments and only 13 percent of the planned projects have been completed since the program was initiated in 1996, according to local reports. The process of redevelopment is slow because of the need to get 70 percent of slum dwellers in any area to form a consensus and because of government bureaucracy. Often seeing the possibility of redevelopment as uncertain, slum dwellers are looking to the political parties that work to provide basic amenities like water, electricity or sewage lines. 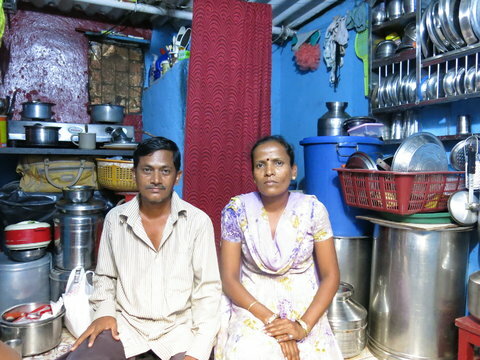 Shamlal Kanojia, 43, who has lived in Ambedkar Nagar, a sprawling slum near south Mumbai’s upmarket Cuffe Parade neighborhood, since 1994, said he didn’t put much hope in government efforts to give people like him new homes. His family’s home is a five-square-meter room, whose crumbling blue walls are lined with shelves packed with steel vessels, clothing and bedsheets. To get there, they have to navigate a dingy sewage-lined lane and climb up a shaky iron staircase. Most of the residents of the slum work as day laborers in the nearby dockyard, or as domestic help in the high-rises adjacent to the slum. Mr. Kanojia, a slight man with an earnest manner, is employed as a driver for a family that lives nearby and his wife, Neelam, works for the same family part time as a housekeeper. Together they make about $215 per month, which barely covers the expenses of raising their four children and monthly rent of $83. Mr. Kanojia said that he had always voted for Congress, but this time he wasn’t sure. “I don’t know if anything will actually change,” he said.